It is now more or less official: Deep Purple will play the UK in November 2017 and the tour is being promoted as The Long Goodbye Tour. Tickets go on sale December 9, with presales starting a day earlier. Support for all 5 shows will be Europe. There are also some a lot less official dates on European mainland in May and June. These remain highly unconfirmed, but look very plausible to our eyes. Some are going on sale in the coming days. At least a couple of German shows are being billed as “Farewell Tour 2017”, but do not read too much into it. Full details in our calendar, which may be updated further quietly. Ah, and one last thing: the first single for the new album Infinite will be released on January 20. Posted by Nick Soveiko on Friday, December 2nd, 2016, filed under News. You can follow comment on this post through the RSS 2.0 feed. You can skip to the end and leave a comment. Pinging is currently not allowed. Europe!! Well there’s an extra hour at the bar ??? I was just thinking, I will definately go until I saw Europe were opening ? It had to come sooner or later…. proof of age. However, as with Elvis, we have all the recordings, etc & tribute band’s performances to feed our continuing purplesque hunger!. A huge thankyou to the band for everything. Don’t cry for me Marge & Tina…… !. Be happy. I believe this “long goodbye” tour will be one of a series of tours going around the world thru 2018. The main reason, of course, to support the Infinite CD. I also see this as being a combined 50th anniversary(the band was formed in ’68)/ farewell tour. Given the ages of both Gillan and Glover(70+) , with Paice turning 70 in ’18, as well as Morse and Airey being in their 60s, I can’t see this band going on for much longer. Deep Purple have nothing left to prove and were finally voted into the Rockn’Roll H.O.F. It’s time for the to say goodbye,ahem, a long goodbye! Just bought tickets for vienna and leipzig and it will be fab! The long goodbye is as long as a piece of a string!!! I hate the O2 arena so if I don’t get a lower tier front seats for a reasonable price then I am saying goodbye to all of you DP guys from now. Seems like they are gearing up for a final touring date in early 18…so they can hit the 50th anniversary. Males sense as a coda, if that is the plan. As much as i want to see this keep going indefinitely, id rather see them go out playing well. I would also rather not kill Paicey in my selfish desire to see one more gig. His health is more important. Paicy had a mild stroke. Healthy people is their 30s and 40s get it and carry on as if it never happened. The guys in DP are fit and healthy and I guess they have access to the best of treatments and recovery. The extensive touring in small venues is not an option for them anymore hence they have to sell big tickets for large audience on the back of the long good bye card!!! Sometime we all have to realize, that the Purple touring machine will stop for retirement. If you think Europe still sounds like they did 1988, then maybe you should take a second look. Their current output is much closer to their original heroes DP, Lizzy, Ufo etc. ‘More or less Official’ … well, tickets and venues are already being made shown on the ticketing sites ..so, lets say it’s deffo ? Europe since they reunited with John Norum is nothing like the 80’s. their latest album War of Kings is superb. Sad to see people bashing a great band based on some hits from ages ago. Thank you all the musicians for the great music since the first line-up. Their Music inspires me since 1978 when I had contact with Made In Japan. Maybe this isn’t the final tour, but it is close for sure. Which is less bad Birmingham Arena or the O2? A very big part of my musical interest will come to an end. The excitement will nerver be the same. Retirement is resonable although they might make some more years. They have been touring and working in the business for so many years. Practically all my life. A great companion through my life. I am forever tankfulla. All those concerts, tours, releases of records, interwiews. All through life. When in school, when studying, when partying, playing music,writing words and music, when starting working, when geting jobs, gilfriends,becoming father, when losing parentes, all throughout my life. They have been there with music.and all those travels, to keep music with me on travels with cassettes, mp3, cd, smartphones, all those lps, singles, cd, VHS, dvd. So many years. Thank you!!!! Ian Gillan should fix up his problems up with Ritchie. Would be very good to have him as a special guest on the very last concerts . Also all the other members like David & Glenn should be there as well. Well – I for one hopes that the explanation is that the new record is called The Long Goodbye ! 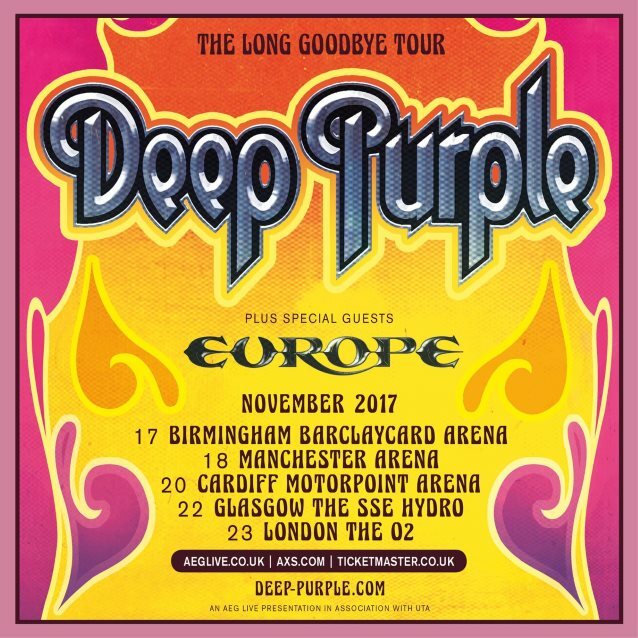 I hope they come down to Australia so i can see them one last time.Father time catches up with everyone so thanks for the great music concerts.Deep Purple have been my favourite band since 1975 when i was fourteen especially with Blackmore in the band.Farewell guys have a long and happy retirement. My first DP Gig was 1985 in Mannheim – Germany. The last Gig at Loreley, it was my 69 DP Show. I hope, i can the Band see several more times. It was a great time to see the Best Live Rock Band in the World. Good health for all members for the rest “Long Goodby Tour”. Si vous lisez ces lignes et vous me comprenez Ian(s), Roger, Steve ou Don passez donc faire un petit concert à Buxy en France, il y a du bon vin et que je serais heureux! A bientôt et comme a dit ce cher Ronnie Long live Rock’n’Roll. Big respectable groups don’t sell ticket on the back of the retirement card. Led Zeppelin, Pink Floyd, Rolling Stones, Paul Maccartney, Bob Dylon and even Ritchie don’t play this card to sell Rainbow tickets. The bottom line is its not gaurentieed that the next DP album will be a classic but what is gaurentieed that fans will buy thousands of tickets on the back of the retirement card. Very sad and very cheap tactics. Having said that I feel sorry for the hundreds of people who work back stage on the DP tour. They are the one who will hurt the most. I discover DP in 84, just after the reunion, and became more and more a fan since the 90’s. I saw them for the first time in 98, Barcelona. I’ve seen them a dozen times since, but none with Jon Lord again. Sad. Barcelona’s 98 was superb, as have been all the other concerts since that one. I’m 47 now and they have become really something ELSE for me through these last two decades of my life. I thank them all and eagerly look forward to see them with my three loves (wife and sons, 3 and 9 -4 and 10 when we attend the concert/s-). Ah, and let’s hope they come to Spain (or some place nearby)! #5 yes but these guys are in their 70s. A stroke is nothing to mess with at that age and at some point i hope these guys can rest on their laurels. @25 – That’s because none of those bands see the end yet (Led Zeppelin died in 1980 and have only done 1 show since). Deep Purple has. Just like Black Sabbath and Rush… No one wants to believe it! Neither do I. But they are OLD and maybe it’s time…. Oh well I’ve gone to every DP show in the past 35 yrs in Toronto! Look back to the RnRHoF live event !!! It was time to say good bye since many years !!! The beginning of the ending starts with the retirement of Jon Lord. I ve seen Deep Purple since 1984 every time they visite my area. But after the years of touring they lost a lot of the freshment of the first Steve Morse years. It´s hard to say and to realized … but it´s sadly true. I – pun intended – infinitely prefer this to one of them dying on a tour bus away from his loved ones. It’s all good – they served for 50 years, calling it a day in 2018 is apt. Their work from Purpendicular onwards provided us with a fair share of excellent music (Purpendicular and Now What?! being my favourites) and Don Airey brought the band back to life after the Good Lord had lost interest a little after the millenium. @29 kraatzy: I disagree as regards Don Airey being to blame for DP improvising less, in fact I find the opposite is true: He improvises consistently more from tour to tour, today DP are in fact a keyboard-led and -dominated quintet with a very good guitarist! Why Steve Morse took such a backseat to Don, I don’t know, maybe he is just the perfect gentleman, maybe he felt he had had his improvisational phase with DP, maybe his hand/arm has been giving him issues for longer than we all thought. I certainly noticed at the last few gigs I saw that playing is sometimes hard work for him, he is not as smiley-happy-effortless as he used to be. What is true though is that their set list has become stale, that happened around the middle of the Bananas tour which started with almost all of Bananas being played (which was great) and ended with the greatest hits set we are bored with today. Gillan once said that Lynyrd Skynyrd’s retro-greatest hits set (essentially a rerun of their “One more for/from the road”-70ies-live classic, they opened with it for DP on parts of the Bananas tour) and how well that went down with the Purple crowd “opened his eyes”. I don’t believe that either Steve or Don had much influence in that decision, I’m sure they would be happier playing live what they recorded and wrote in the studio. uwe @ 30- I am being a little pedantic here, they didn’t exist as a band for 7 years or so! 43 as a band in one form or another by 2018, 50 years since the bands formation. I am not sure as to the same producer being used over & over, things can sound too similar after a while when that happens. Having said that, Ezrin has definitely ‘put the Deep back into Purple’ as was intended! Cheers. uwe @ 32- I agree with Airey being an improviser. He has a background of a more progressive style, than Jon Lord to my ears. Much more into an adventurous take on things. The same with Steve Morse, however The Dregs & his solo band & material are far removed from DP. So yes, he does tend to take a back seat it appears. DP isn’t his band & the Hammond HAD to come to the fore, giving Airey more freedom. Ezrin has done a good thing there imo. It would be interesting to hear Airey & Morse in a different project, with another drummer & bass player, I could enjoy that! Cheers. @MacGregor. You should check out the Livin Loud project (album + live show). Morse, Airey, Jimmy Barnes, Lee Kerslake and Bob Daisley. MacGregor: Actually, Steve improvises more with DP than with any other band (he has said so himself). The Dixie Dregs, Kansas, The Steve Morse Band all play a music much more intricate than DP, but it’s highly laid-out and pre-arranged, not much improvisation going on live at all, bit like Rush live, they don’t improvise much either, but recreate their studio arrangements (though when I last saw them a few years ago, there was more improvisation going on than when I saw them first early 80ies circa Permanent Waves). Much like Bolin, Steve is an underestimated rhythm player (so is Eddie van Halen btw, his rhythm playing is brilliant), his rhythm playing totally changed Purple’s groove, he made them more American and less “Yuropean”. Ritchie’s guitar style – never mind his admiration for Nashville players – oozes Old Europe. Not a criticism, just an observation. Am I the only one who thinks that Steve sounds major key’ish even if he plays minor scales and with Ritchie it’s the other way around? @ 36 kazz. Yes, I read DP will be performing in the ZiggoDome in Amsterdam on June 2nd 2017. Would be superb !!!!!!!! Cheers and bottoms up everyone ! DP were, are and will remain the BEST EVER !!!! Just shows you how out of date some people are with regards the music scene.Europes last few albums have been outsatnding,nothing like their pop rock offering of yore. Its classc heavy rock in the mould of 70’s Purple,Whitesnake,Zep,Rainbow,UFO. Ive seen them half a dozen times since they reformed, was never a fan of thembefore,and i was blown away by them. Purple is my band of choice and my emotional attachment and loyalty to them is sometimes overwhelming but i can tell you for certain that if any of you stay in the bar for Europe you will miss out on a treat. Two guys i met at the Ramblin Man fair this year were dismissing Europe prior to them coming onto the main stage. After Europe had done their set they were converted. As for this being the last tour, well, though i hate to admit it, i think its about time as Big Ian doesnt look too good these days and Little Ian has some potentially serious health issues. Lets hope they dont stretch themselves too far and cause any further issues with their health. The Mechanic Ted @ 35- I did at the time, I don’t like Barnes though, so I always thought they should have had a decent vocalist! A very good band though, plenty of talent there & they are playing cracking songs at times! Cheers. MacG @ 33 – ah, those lost years, when the band was not in existence – the longest years of my life! Oh bugger, I mean does anyone know about Australian dates? Any update on dates in Sweden?